Everyone loves a good collection of threads, but unless you have the whole set of DMC threads you’re going to need a way to keep track of what you have, and haven’t got. That’s why we created this awesome colored spreadsheet of all standard 6 strand DMC threads, so you can keep track. Just click the link or image and save the spreadsheet. You can access it on your computer, phone, or put it through googledocs! How did you determine the RGB color values for each floss? Hi, it should be noted that all screens display colors differently, so the RGB values are representative only. That said, I worked on a cross stitch pattern generator in 2014, and we were able to work with a well known UK based online cross stitch supply store to get CMYK codes direct from DMC. These were converted to RGB. The new 35 colors had RGB codes included in the official marketing pack. Hope that helps! Thanks for offering this. Much appreciated. How do I download this onto an iPad? Hi, As this is an editable file, and not a pdf, you’ll need something that can open .xls files. There are a few ipad apps that can do this, including ‘Numbers’ a free app by Apple. Does this include the newest colors? Yep, all the new 35 colors are included! This may sound like an obvious question, but what are the letter abbreviations after the colours? I get LT, MED, DK – I’ll assume that’s light, medium and dark… but what about the others? Thanks for the heads up, its been updated now! I know HTML color codes are subjective, but the following colors are incorrect, either in RGB or color name (or both): 535, 543, 520, 580, 581, 561, 505, 597, 517. 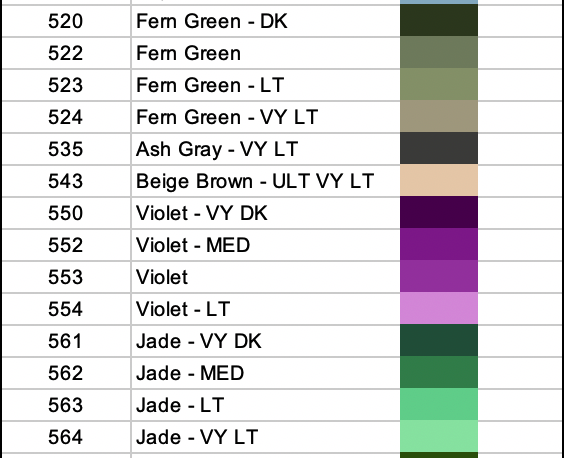 For example, 561 is a deep forest-y green, but the chart calls it light violet, and it’s a muted bubblegum pink. This is a great resource : ) thanks!